Don’t you think it’ll be interesting to see how they have turned around to hit a $450 million valuation? That’s what we thought and it is, indeed, pretty interesting. Discretion: Insider Inc., originally called Business Insider Inc., is an American online media company known for publishing the financial news website ‘Business Insider’ and other news and media websites. As you know, Business Insider is the largest property in terms of both readership and revenue. So, we’ll be focusing on Business Insider in this study. That being said, we’ve to cite the group revenue in some cases, as the parent didn’t breakdown revenue of each of its properties (after all, it’s a private company). The publisher is new to digital and didn’t have any print legacy. So, you wouldn’t see bigger numbers as you saw in The Guardian, The New York Times, etc. They attracted approximately 1000 readers per day and by the end of 2008, they had 2 million monthly visitors to their site. The annual revenue, mainly from advertising was around $700k, but the expenses were more than $1.3 million. A crew of just 6 ran the business. According to Alexa Business Insider is among the top 100 most popular sites in the US, and according to Similar Web that is the most popular business news site in the US. Business Insider has raised a total of $55.6M in funding over 7 rounds. Let’s talk about the actual business. 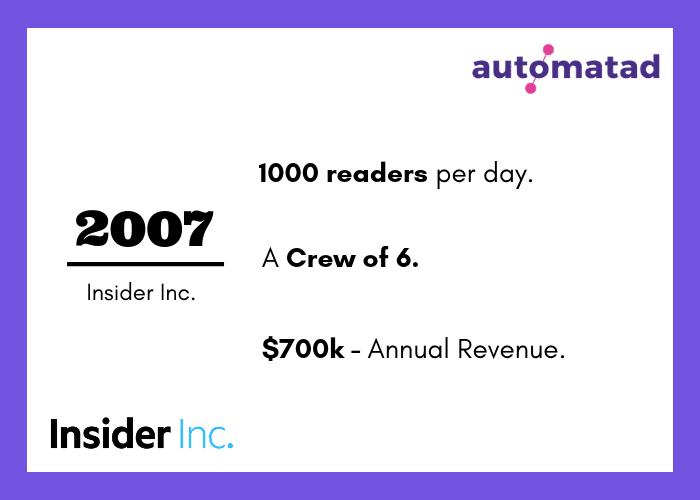 Pete Spande, Publisher and CRO of Insider told Digiday that the parent crossed $100 million in revenue, a major milestone and is profitable (Src). As predicted, the majority of the revenue comes from advertising, however, BI Prime, BI Intelligence plays an important role in propelling the revenue. Let’s learn how this business website evolved into one of the top publishers in the world and reached 350 million users worldwide(Src). There’s a real advantage when you start with the right team. You can do the job better and most importantly, you can see the trend and pivot to scale the business. Henry Blodget, a former Wall Street analyst (banned from the market on fraudulent charges) joined hands with Dwight Merriman, and Kevin Ryan, DoubleClick founders to start a Typepad blog, then called ‘Silicon Alley Insider’. They had a simple, straightforward mission – “Tech Blog for New York”. The publisher wanted to run a tech blog for New York business people. Having a precise and specific goal is extremely important for a media business. It helps in content, distribution, advertising, and several other aspects of a business. They started with a basic website and direct campaigns were their primary source of income. It is way easier to approach and convince a business to invest in you when you write what matters to the customers of the business. As the site primarily offered aggregated content and commentary on the financial news and events, the publisher was able to onboard advertisers early. Back in the day, you can’t make much from AdSense or any other ad networks. Programmatic didn’t exist at all. 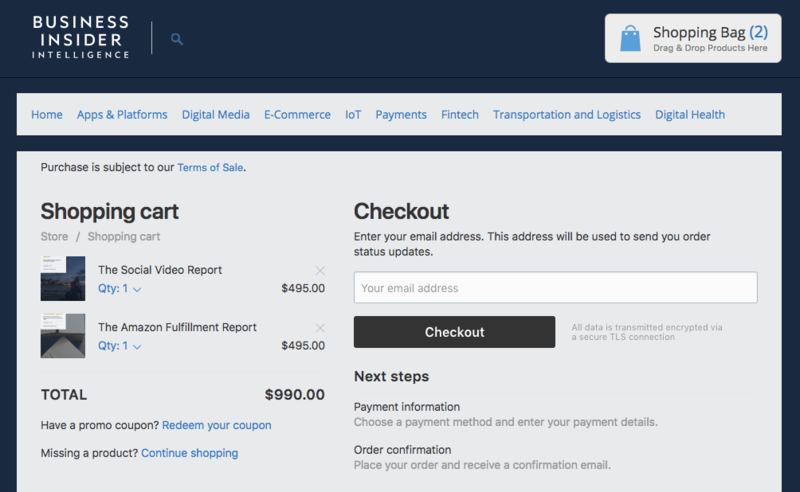 Direct deals are the best and reliable way to run a digital media company. To be frank, the founders have the stellar track record of building unicorns, except for Henry Blodget. It was quite obvious that they’ll be backed by investors. That being said, no one wanted to invest in a digital-only media business. Especially, Silicon Alley Insider wouldn’t be as big as other publishers as they wrote for New York. The competence of the team and initial market traction helped them bag $900k in a seed round, the very next year. That’s the huge feat and it allowed them to hire more editors and push 20 posts per day. 2009 also saw Business Insider’s selection as an official Webby honoree for Best Business Blog. Recognitions aside, Silicon Alley Insider has to grow much faster as they’re fueled by investors’ money. At the end of 2009, the publisher collectively has 2.6 million monthly visitors, which is roughly 30 percent higher than that of the previous year. They still aren’t profitable and lost $375k. Though the publisher decreased its loss, increased its gross revenue to $2 million, it couldn’t figure out a way to scale. If you cover a particular niche and only target a specific city, then there’s no way you can grow as fast as other news sites. At least for a long time, because of the saturation. – Owen Thomas, a BI vet (Src). It’s clear that, at this point, the publisher decided to expand its horizons and break even. That led to “The Business Insider”. They dropped “The” later (remember, the facebook?). It is true indeed. Digital media properties can thrive/sustain only when they scale or become niche publishers (with considerable niche audience). The publisher realized it sooner. – Henry Blodget, Founder, and CEO of the business insider. The publisher’s move from Silicon Alley to Business Insider worked well and in 2010, Henry Blodget announced that Business Insider is profitable. The publisher did $4.8 million in revenue, but just $2000+ in profit. That’s the actual profit and to put it Henry Blodget’s way, it was enough to buy a Macbook. The traffic went through the roof. Here’s a graph indicating the steady rise in the traffic. Business Insider has capitalized on its readers, not just for advertising, but also for exclusive stories. In many instances, BI has been able to break exclusive stories with the help of its readers. PaidContent selling for $125 million, Google’s integration of AdMob, eBay’s Milo.com acquisition, etc. are all sourced from the readers. They even send out a personal note/post on the website to its readers whenever they hit a milestone. In fact, many critics argued that BI is trying to adjust too much to woo readers. Now, with the growing traffic, editorial needs, and marketing budget, BI decided to raise some money from the investors. The publisher did raise $3 million from RRE Ventures and existing investors but had to deal with a lot of failed attempts. – Kevin Ryan, Co-founder of Business Insider (Src). The entire digital media landscape got revived when AOL paid $315 million to acquire The Huffington Post. The year changed the perception of media companies in the eyes of VCs and investors. BI had about 45 full-timers on the team, of which about 25 work in the newsroom, 10 in engineering, and 10 in sales and management. It was time they try their next attempt to raise funding. Thanks to the HuffPo’s $315 million sales, BI pulled in ~$7 million from Institutional Venture Partners (IVP), which is $5 million more than they tried to raise in the first place. With all these positive developments for the company, the website has, however, faced criticism for what critics consider its clickbait-style headlines. There’s a subreddit (inactive and archived content, mostly) to criticize the publisher’s headline and several critics defamed BI for its headlines and slideshow content. – Henry Blodget in TechCrunch Disrupt Panel. The site attracted 12 million unique users a month and as the publisher began to reach readers across the US (not just New York), it had to change its style to pique the interest of a common business owner or a manager. But we all know they went too far to get clicks. The content standard (delivering what was promised in the heading) and exclusive news coverage helped them to sustain and grow, even in the midst of the severe criticism. If there’s one thing you shouldn’t follow or try to emulate from this study, it’s the link-bait headlines. It may worked for BI in the past, it won’t work for you today. In case you didn’t know, programmatic was nascent and only some publishers remained bullish. The heated arguments about machine vs human in ad sales, complexity, etc. echoed across the industry. BI, which depends on advertising predominantly doesn’t want to miss the first wave of programmatic. Besides using programmatic, it encouraged other publishers to follow the same. The reason is clear. The digital publisher has a huge audience base and advertisers want to cherry pick who they need. 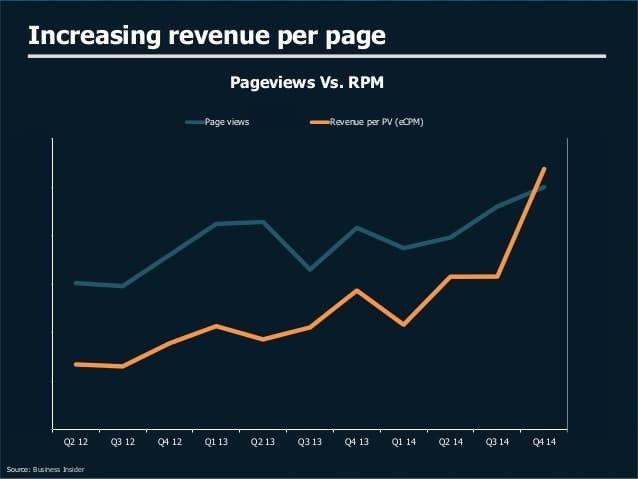 In order to retarget and pick the relevant readers, BI embraced programmatic. – Pete Spande, CRO of Business Insider. Just after 2 years of its last round, BI raised a massive $5 million from Bezos Expeditions. The goal of the investment is scale up the team. The publisher was producing tons and tons of content every day and increased its revenue to $11 million. The ad rates were low, at the time. They attracted 24 million unique visitors across the worldwide and 9 million of them are from the US, as per Comcast. Also, the wrap had issued a report on an anonymous buyer, who was ready to buy out Business insider for $100M. It was a great year for BI, considering the last. 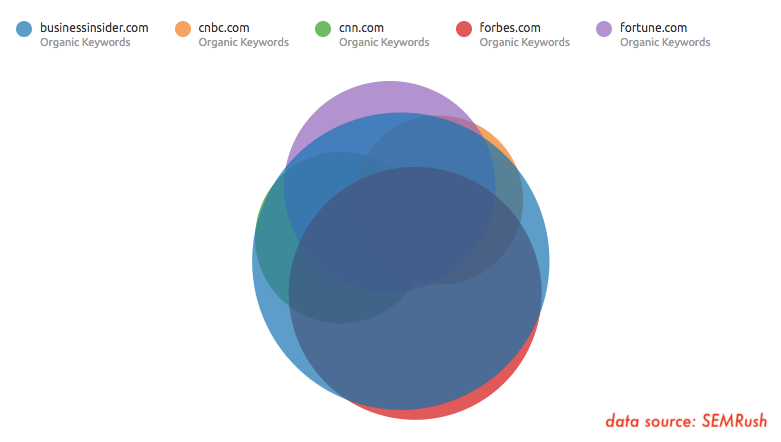 In 2012, it spent $3 million to expand its verticals and reach more overseas readers. Though it worked in part, Bezos investment allowed the publisher to make its next big move – Subscription. 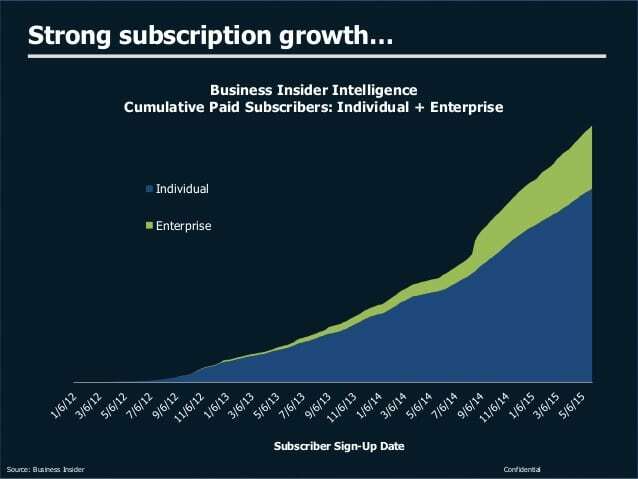 Business Insider started its own research unit, BI Intelligence. We consider this as one of the most successful decisions ever made by the publisher. Let’s picture this. You’re a publisher with expanding verticals and wide-content coverage. 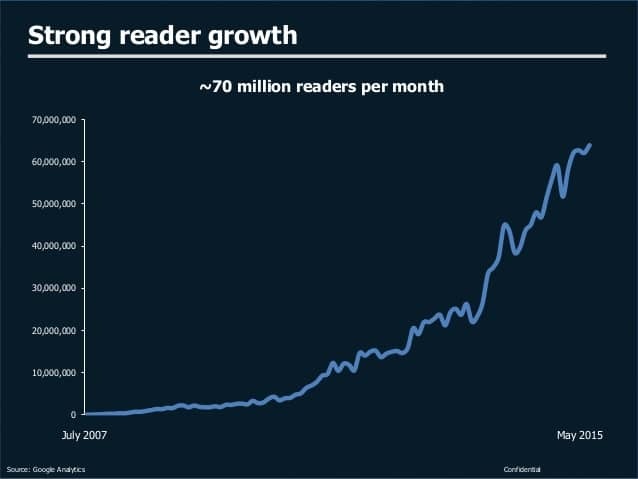 Your readership is growing faster than most of the publishers and you know your readers visit other financial news sites too. We can derive two inferences here. Your readers are mostly business people – better ad rates and better revenue. BI already used programmatic to make sure the ad revenue from their inventories is higher. Your readers have deeper pockets (not all of them, but many of them) – BI didn’t capitalize on this aspect until BI Intelligence came to get the dollars directly from the readers. It worked out well. BI grew its research group to 40 people and had 7500 subscribers for $2500 memberships, in the next 3 years. – Henry Blodget, CEO of Insider Inc (Src). What we found interesting is, publisher analyzed who the audience are and then launched a different product, rather than asking to pay for the content. Now, it has a different revenue stream which functions like a separate entity. It’s easy to say publishers should try private marketplace (PMP), not just open exchanges today. But Business Insider knew it from the start. The publisher knows that PMPs have the ability to connect them directly to premium publishers and promotes competition to increase ad revenue. – Bridget Williams, Senior VP of Business and Audience Development, BI (Src). BI partnered with Times Internet, the digital arm of Times of India in 2013 to expand and reach growing tech readers in Asia. Business Insider India is the right and expected move from the publisher. Because the same year Gawker Media shook hands with Times Internet with the same motto. To BI, a new reader-base might push them towards profitability. As a VC-backed company, BI had to do both – expand aggressively and grow 5x/10x YOY. International editions helped them to get more readers, Advertising and BI Intelligence took care of the revenue. 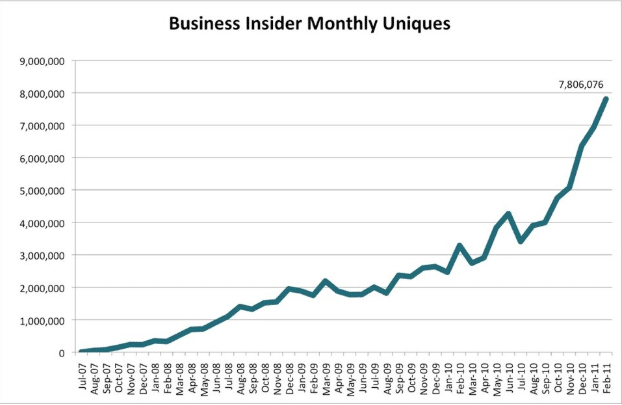 Business Insider has long been a digital-first publisher. It sold the same story on several conferences, investor meetings, and even on memos. And, to put it simply, it’s narrowed down what they need to do and how to do it. Being digital-only means you can evaluate what is working for you and your readers and iterate the product instantly to better the experience. The publisher is still doing it and we are certain that it will continue to do so. – Nicholas Carlson, Chief Content Officer, BI. – Platforms (including screen sizes). The New York Times reported that Business Insider’s traffic was trailing close to that of The Wall Street Journal. The publisher had 26 million unique monthly visitors in May, according to Comscore and that’s 2 million higher than Forbes’ monthly uniques. With the recent expansion to India and exponential traffic growth, BI convinced that the UK would be their next stop. The UK has a lot of business readers and traffic potential. And, to do this, they raised their best investment round at the time – $12M*. *Wondering how it bagged a $12M? For one, it has grown its reach and revenue faster than any other news sites. Two, the digital media landscape was thriving after a few big exits. It accelerated the process and in November of 2014, Business Insider UK was launched with 7 editorial staff. BI has a long history of catching up with the evolving technology and trend. We already mentioned that the publisher stayed bullish on programmatic advertising. When the native advertising (sponsored content) started to go mainstream, automating the native formats (as display banners) became a hot topic. BI believed programmatic will eventually devour native advertising. – Peter Spande, chief revenue officer, Business Insider. It also addressed the other side of the coin – Readers might confuse sponsored content with actual site content and native advertising networks/SSPs need to make use of first- and third-party data to make sure ad content is relevant. Both issues were cleared and now native programmatic advertising is $41.14 billion markets in the US alone (Src). So, yeah, we would say BI made some impressive bets and won. And, this is one of them. As you know, BI became a part of Axel Springer in 2015 at a whopping valuation of $442 million. But the publisher didn’t talk to Axel Springer for expansion. It was a quest to further expand that got them into acquisition talks. Hanse, BI’s head of business development reached out to Axel Springer and other German media companies to discuss a licensing partnership. The German media group ended up putting a $20 million for 9% of BI and a seat on the board while leading a $25 million round in 2015. The funds were used to launch Tech Insider with a staff of 40 and a month later, they launched Insider, a lifestyle-focused website. Both of them opened the M&A door for BI. Axel Springer decides to acquire 97% of the BI for an impressive $343 million and the rest 3% is still owned by Jeff Bezos. Now it was the largest M&A for a digital media startup and many analysts said that the media group overpaid. – BI’s revenue was at $42.4 million and it lost $11.9 million in 2015. But the revenue rose 41%. The growth rate is predicted to get higher in the upcoming years. Besides, expansion plans and re-investing in initiatives led to the loss. Axel Springer knows it well. – Tech Insider, covering tech and science for general readers (not just business people) and Insider, a site designed to capitalize on social media distribution and video consuming readers were strategically planned and launched at the right time. – Well, Mathias Döpfner, CEO of Axel Springer likes the BI’s vision and Henry Blodget. – Mathias Döpfner, CEO of Axel Springer (Src). – See the growth charts for yourself. We suggest publishers to grow the audience of tomorrow. BI’s 48.3 percent of the audience is aged 18-34, making it a millennial site (in terms of audience composition) than the rivals Forbes, The Wall Street Journal, Bloomberg Business, and Yahoo Finance, according to Comscore. We all know the reason. The publisher ran and produced digital-first content (videos, slideshows, short-form articles, etc.) more than anyone and improved the content quality over time. In fact, they have their own studios. – Both open exchanges and private marketplaces. Business Intelligence is a reliable and consistently growing revenue stream. As the publisher is not a VC-backed media company, they have the headroom to focus on the long-term. That led to Market Insider, a visitor can create personalized portfolios and get updated market quotes for stocks, exchange-traded funds, mutual funds, indices, bonds, etc. In addition to the subscriptions and advertising, the publisher had an eye for commerce. 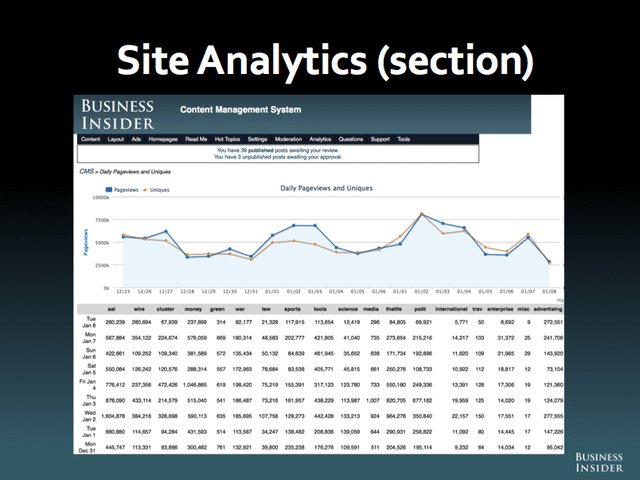 In fact, the following slide from Business Insider is presented (in 2015) to depict the future of BI and digital media in general. In 2017, Business Insider made two noticeable decisions – Implementing a paywall and dropping “Business” from its name. Paywall – After year-long experimentation, Business Insider launched a freemium subscription model where some of the content is paywalled and majority remains free. The publisher said it is trying to capture the die-hard financial news readers of BI and considering its early prime service (Intelligence), it is a valid option to explore. Insider Inc – By the end of 2017, Business Insider has a couple of web properties targeting different verticals, a ton of social media pages, Facebook Watch shows, and a studio. 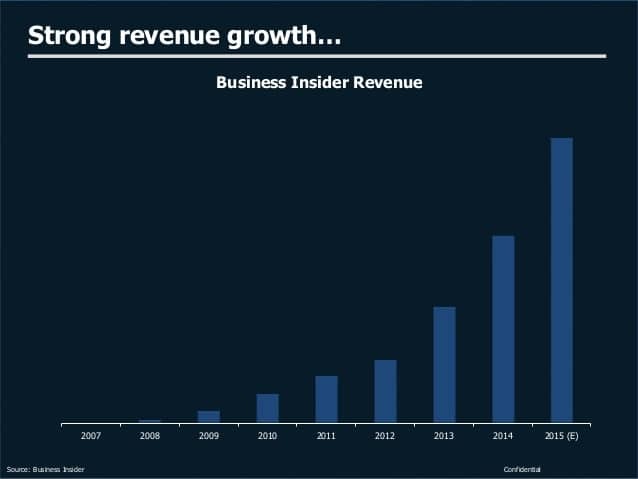 Business Insider became Insider to reflect how they’ve evolved and how they’re going to grow in the future. Insider realized it can’t just rely on Facebook to reach new audiences. It is true that BI garnered over 3.5 billion monthly video views on Facebook, but the algorithm changes made it clear – Publisher can’t expect to grow consistently on Facebook. Unlike other publishers, Insider creates video content every day and it needs to figure out a way to distribute it effectively. Because the publisher knows that’s how it can attract the Gen Z. Soon, Insider TV, an OTT app lives on Roku, Apple TV, and Amazon Fire has been launched. It features all the content Insider and Business Insider produces except Facebook Watch shows. Unifying the supply may not be a requirement for most of the publishers. But Insider Inc, with its expansion plans and local media partnerships, has a total of 17 international editions. All of them have grown to attract millions of readers every day, but a media buyer who wants to run a direct deal with Insider Inc didn’t have any way to do it. The advertiser can buy the ad impressions programmatically using different ad platforms. The publisher built a marketplace where advertisers can reach BI readers worldwide by connecting to BI marketplace. The marketplace unifies and functions like a PMP to ensure brand safety and scale. We’ve tried to get you the story of BI (now Insider Inc.). As you can see, the way they approached is completely different from other legacy publishers. Digital economy can support digital media, neither print nor TV. Insider Inc. is part of a media group which is looking to build a sustainable, long-term business. The publisher isn’t planning to trade user experience for high-growth rates. 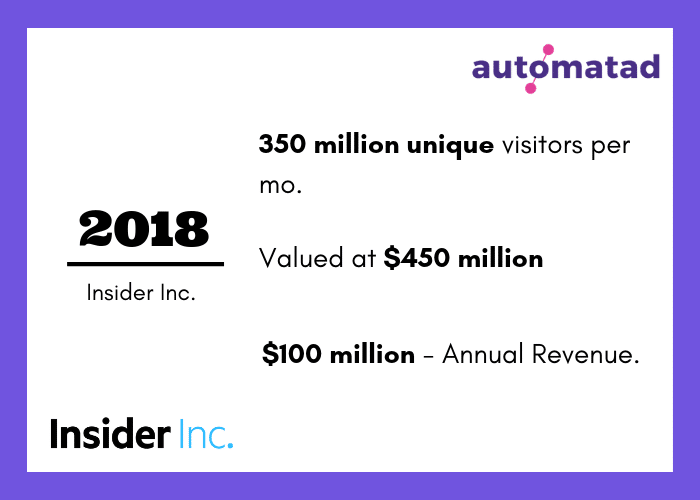 They’re already profitable and are planning to expand “Insider” to new verticals – Car Insider, Travel Insider, or Pet Insider. So, we’re excited as you to see what the publisher will do next.